Most of my life my Dad was TDY (Temporary Duty) or Deployed with the USAF so he tried to fit in as much time with my brother and me when he was home. He also remembered to bring us with gifts, not pricey gifts but things to show he was thinking of us, each time he had to go away & normally the gifts were something interesting that was special based on where he had been or custom things made by very skilled native artisans from where he was at for his TDY or Deployment. I have lovely jewelry, beautiful hand carved jewelry boxes, scarves, Peez dispensers from everywhere he has been, and lastly a stuffed animal or toy from where ever he was stationed while he was away. When I was younger I didn’t have as close of a relationship with my father as I would have loved to have, I loved him, he also loved me, and I figured and loved all that we did together, but he was gone so much and we weren’t able to communicated easily, we weren’t allowed to know where he was and we only got monthly calls when he was gone, letters were nice, but not the same as having him with us. 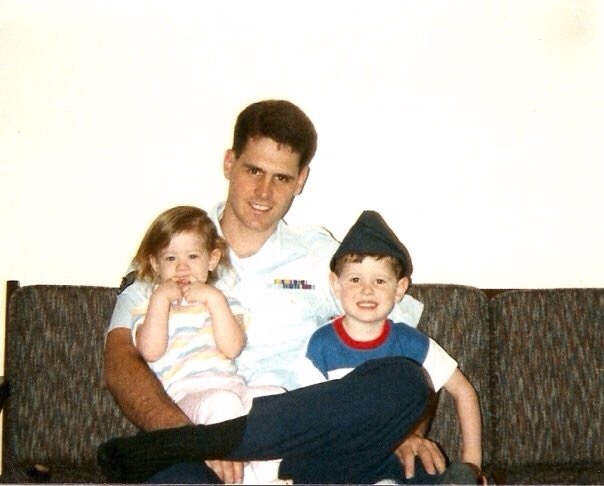 My Dad, brother and me with him in his Dress Blues a long time ago. When my Dad decided to stay in the military, the last time before he retired, and had his ceremony was held on Friday, October 13 on Elm St. and then we got orders to move. We knew we could get sent to one of three places Ohio, Hawaii, or Texas. He got orders to San Antonio, Texas and he had to be here January 1st. It was a family joke that we were sent to “Hell” because of when and where the ceremony took place. We were not happy to move here, but in the end I am grateful because of people and experiences I have had since we moved here. He was deployed to some place in Turkey for four months, which turned out to be the six months before he had to be in Texas. He got home a few days before Christmas and he took the first truck load of household things with him the day after Christmas to San Antonio while we stayed in Virginia to finish my Freshman year and my brother’s Junior year of High school. It was very hard on my Mom and all of us to have him gone for so long. We were blessed with the ability to video chat with him while we were finishing out the school year. My Dad took leave to help us finish packing and make the drive from the coastline of Virginia to Texas. I was too young to drive, so I switch vehicles helping the drivers get food, drink or just communicate with the wakie-talkies we used to stay connected as my Dad drove the truck, my brother drove his car and my Mom drove the family van. After we moved to Texas my Dad didn’t have to go away TDY or on Deployment as often so I was able to form a much better relationship with him. We started to do father-daughter dates where he and I would do something together we both loved. He also was able to help me out with some of my medical appointmets. I had major medical issues all my life, another family joke is that I must have skipped the line in Heaven for health before I was born. My Dad took time off from work to make sure I made it to all of my appointments and would stay with me overnight when I had to stay in the hospital, despite his hatred of hospitals, and made sure I got what I needed when I needed it. 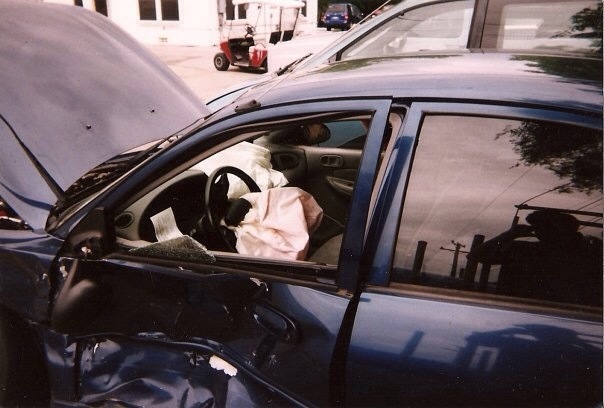 My senior year of High school, 2 weeks before graduation, I was in a major car accident. I called my Dad when my purse was retrieved from the back of my car (it was in my lap when the other car hit mine). My boyfriend at the time was driving and it was his side of the car that took the impact but by God’s grace he was not hurt beyond a small head laceration. I stupidly braced, which I know is just a reflex, and dislocated my wrist, elbow, and shoulder in the accident, got a great concussion and tore all but one tendon that held my spine to my skull. I was so out of it when I spoke to him I was upset about my car being totaled and thought I was banged up but fine. He showed up just in time to see me being loaded into an ambulance on a back board while the EMTs were talking about how they thought I was internally decapitated and the ride would have to be very slow and to not bump me. As I’m sure all of you can imagine this freaked out my Dad. My car was really bad, but all he cared about was me. My car after the accident, by God’s grace the impact t-boned, going around 90mph after leaving 20ft. skid marks leading up to where we were hit, the car more towards the front. The front axil was broken and the driver’s side door was split at the window opening about 4ins. The speaker my brother installed for my sound system from the driver’s side door left a bruise on me from it being knocked out of door from the force of the impact. That accident is what cause my chronic pain syndorme, RSD/CRPS and my Dad made sure the doctor’s listened to me and pushed for them to figure out what was wrong. He took me to all of my pain management appointments and stayed with me after surgeries and even outpatient procedures. I became very sensitive to vibrations so my Dad bought a projector so I could “go to the movies” with him on our Father-Daughter Dates. He would go to the store and buy me candy, popcorn and we would drink soda when we got the projector set up and start the movie. The last few movies we watched on our dates was The Hunger Games and Twilight Saga, and the rest of the series that had been released on DVD at that time. We had both listened all the books for both books before we saw the movies because we are both dyslexic and audio books made reading easier (plus we could “read” and drive at the same time.) We both have a passion for books and he found the best books and series for us to listen to and talk about together. When we were reading the Twilight Series my Dad started to joke that I was his Bella since I am as accident prone as Bella is in the books. We discussed many other books and loved it, but only Twilight gave us such a good inside joke. I loved being able to have such intellectual discussions with my Dad. I had always been a Daddy’s Girl and we were close in our own way, but these father-daughter dates really helped us to have a closer relationship that helped me as a young adult and now adult. My Dad always said I will always be his baby girl, he even changed my ringtone for when he called to Rodney Atkins’ Cleaning this Gun. It was another joke, because he wanted to approve of any boy/young man/man (it changed with age of course) that showed interest in me. He approved of many guys, and those he did have turned out to be great men, who are good with their family or those who haven’t settled down work hard and are good men. The ones he disliked I should have listened to him about, but I failed to and had to learn things the hard way, I know that hurt him. I also know no matter what he loved me and did everything he could to make my life better. Anyone who has read my prior posts knows my Dad died last March on the 18th. His death was sudden, unexpected and very traumatic to my entire family. My Dad seemed healthy, he had been taking me to my Ketamine infusions and caring for me after them since they tire me out and are hard on my system during the infusion, but effective in helping me function better with the pain levels I have. After an infusion, since I am tall at 5’8″ (which used to be 5’10” before my 3 spinal cord stimulator surgeries) and the nurse is not, he would help me out of the recliner I get the infusion in and tell me to hug him as he lifted me up into the wheelchair that took me to the car he would pull up, another hug to help me get into the car, again when we got home to a transport chair since it was difficult to walk or balance after the first few months and the last time to get onto the couch that was in the “play room” for my niece when she visited. This reminds me of how wonderful his hugs made me feel, the warmth, safe and loved. The night he died I felt too tired and sick (later we found out I had gallstones that were causing me pain and other symptoms) to go down to him and tell my parents I loved them and goodbye before they went to work on our rental property. One tenet had moved out and the house needed some touch ups and cleaning before the house was put up for rent again. I will always regret not doing so, I took my night medications and was getting ready for bed when I got a text from my sister-in-law. I had that feeling when I got a text from my sister-in-law that my Dad was sick and being taken to the hospital by an ambulance. One of my “adopted” brothers (this is someone not related by blood but considered family by everyone, this brother even called my parents Mom and Dad) offered to drive me to the hospital where I thought we would be waiting while he was in surgery or something like that. I called one of my other adopted brothers and told him what I knew. If I had been thinking clearly I would have know I was wrong about my Dad being in surgery since my brother by blood told my adopted brother what I did not know and to go home. I worked in an ER as a medical scribe before I became disabled and I knew when I was being lead to a room where families are told their love one had died. As soon as I saw where we were being lead by a nurse and a minister I knew I would not be waiting for my Dad to get out of surgery, part of me tried to walk away from the room because as long as I didn’t hear the words there was hope. My brother and the nurse finally were able to get me to the room and I heard the words I dreaded. Since they were just waiting on my arrival it was then time to go say goodbye to my Dad. He was so cold and I fell to my knees at his shoulder. I tried to warm up his hands that were always so warm, I laid my head on his chest and shoulder praying that I would hear his heart beating. I prayed to God to please let my Dad live and to take me, but it was not my time to go Home yet. I made a promise to my Dad, God and myself that I would never attempt suicide or to hurt myself because my Dad and I had a discussion about how depressed I had been feeling and how I had suicidal thoughts on a regular bases. (I felt depressed due to medical issues I will elaborate on in another post.) My Dad was so saddened by this and begged me not to do so because he believed God had a purpose for my life. I was so upset in the ER room that the doctor had to give me a sedative to help me. My Mom, brother and his wife sent me out to my adopted brother I had called when I got the text who waited for me and was such a kind gentleman to me. He was supportive despite the fact he was beside himself with grief as well, he sat with me at my house until my family arrived home since he knew that I had attempted suicide before after another very personal loss. I assured him that it would not happen and shared with him my promise. When my Mom got home we slept in the same bed because we did not want to be alone. We bought the Cross with the flolded flag at the foot of it to honer my Dad. It is coming up on one year since my Dad has died and while I still feel grief daily from when I wake up till I go to sleep I have sometimes when the grief overwhelms me and sometimes it is bittersweet when I remember a happy memory. I talk to my Dad regularly and we have set up a beautiful memorial cross that looks like a folded flag is sitting at it’s base that we are using as a marker for my Dad. We all wanted something we could take with us no matter where we live and because it was my Dad’s wish to be cremated and to not have a grave marker in a grave yard. We also have a place where his flag that was given to my Mom at the funeral, a Willow Tree Angel figurine and a photo of him in my Mom’s room for now until we decide where we want to put it. I have tried holding in all of what I was feeling and have learned that I cannot do that, I lose my temper on friends and loved ones when I do that. I now allow myself to grieve when I need to, by crying, talking about him or just ranting to someone. I know that this sadness and grief will never fully go away, it will only become less intense and lighter the majority of the time. There will always be times that grief will overwhelm me, but I know God would not give me more that I can handle and I can always lay my troubles at his feet. I hope and pray that not many of you, my friends, have had to deal with this kind of grief of a parent or a loved one who is so close to your heart. If you have I pray for comfort for you and your family, I know that time might make the grief and pain more bearable, but I know that we all need prayer for comfort and peace for the rest of our lives after such a loss.